For the sake of this discussion, we will only consider centrifugal pumps – but if you are doing rockets and not using hydrogen, that is a good assumption. The pump on a rocket is broken up into 3 main parts: the inducer, the impeller, and the volute. The inducer is a low pressure rise pump that limits cavitation in the impeller; it is only necessary for high specific speed pumps, which is most of rocketry. 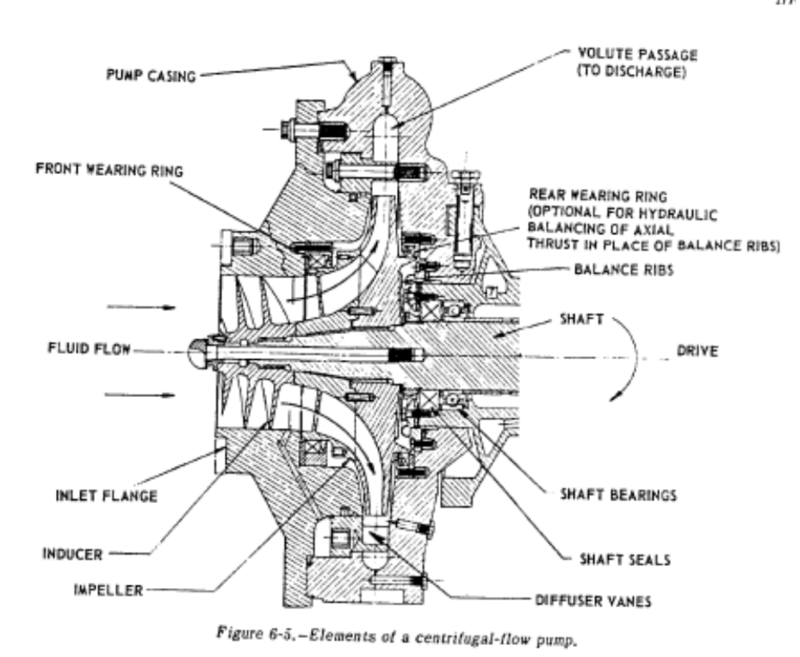 The impeller is the main pumping element and is effectively a paddle wheel that takes slow moving fluid from the core and ejects it at high speed from its sides. The volute takes the high speed fluid and slows it down, converting the high speed to high pressure. All told, they make up a rocket pump, but we will just go over the basic sizing of the impeller and not worry about fun things like velocity triangles today. All of the basics of a standard rocket pump from SP-125. A specific petrol impeller I did for some people from aRocket. Once you have done all of the basic sizing that we talked about last week, you have the basic properties of the pump system but no sizes. If you want to do a detailed pump sizing, I would recommend NASA SP-125 and SP-8109 as it is a bit more complicated than a blog post. But, today, let’s get you the two biggest pieces of information you need: outlet diameter and outlet height. 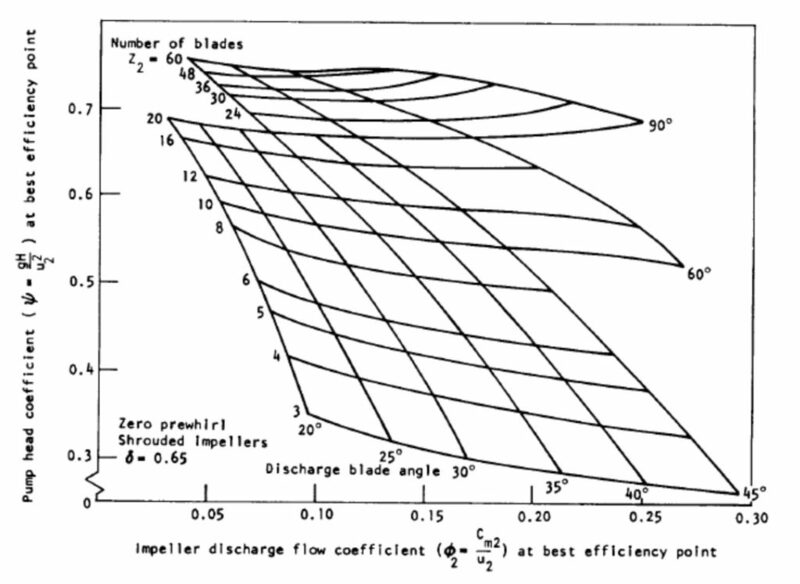 These are useful to determine the mass and manufacturability of the pump, as outlet height is usually the smallest geometry and diameter of the impeller and, thus, the volute determines most of the mass properties for a pump. Then use the plot below. Head Coefficient as a function of Specific Speed and Specific Diameter (from SP 8109). So now iterate on that for a bit, and we have the outlet diameter. Flow coefficient is usually between 0.01 and 0.15 and can be found on the plow below. 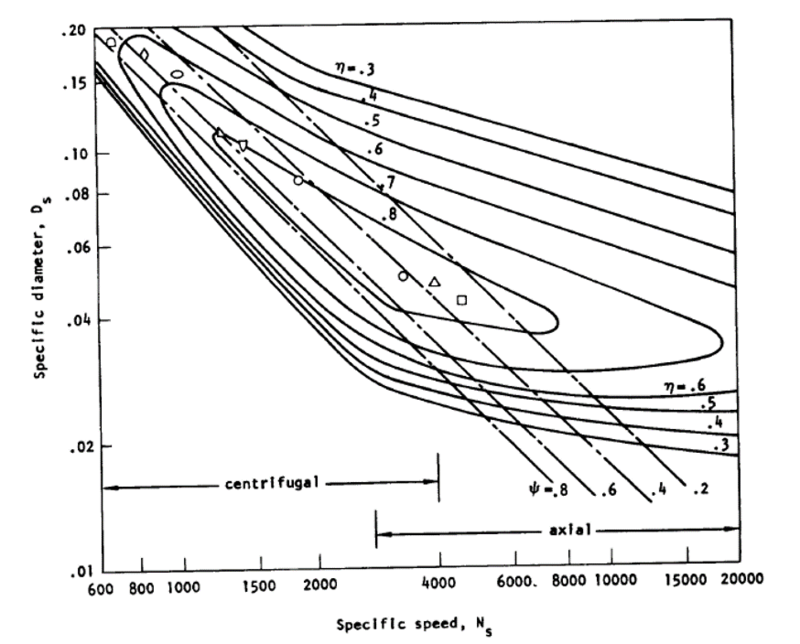 Flow Coefficient plot from NASA SP-8109. 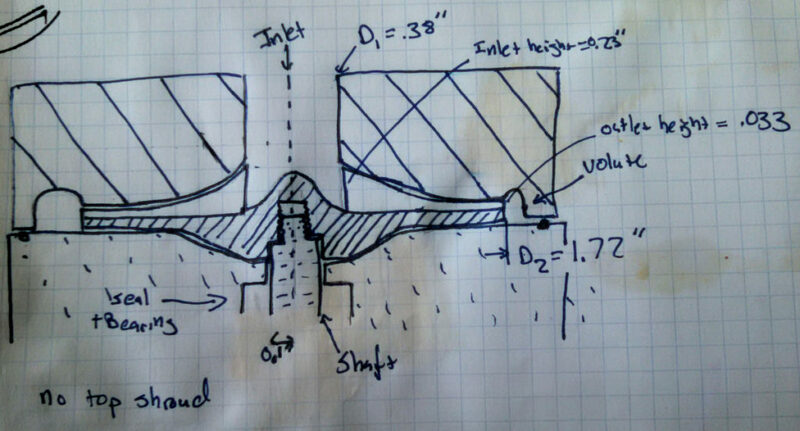 I hope this has all been useful in determining how to size a impeller; obviously the final design is more complicated with flow angles, but these basics should point you in the correct direction.